Welcome to "Home Health Chemistry" - your source for do-it-yourself hazardous chemicals detection! Here you’ll find all the information and tools to test for toxic and dangerous chemicals by yourself in your own home. You’ll learn from a professional chemist about common chemical hazards found in your home and how to use simple techniques to detect them and protect your family. What are your home health concerns? Are you concerned about the presence of hazardous chemicals in your home, such as lead in your child’s toys? 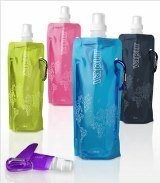 Or perhaps you wonder about the safety of eating from BPA containing plastic containers, the Parabens in your deodorant, cosmetics, detergents, or other products you use on a regular basis? The truth is that most people have their suspicions but probably don’t have the knowledge or an easy and cost-effective way to test for these potential hazards. Plus, most of us can’t make heads or tails of product labels. And there’s no guarantee that products claiming to be “natural” or “green” are any safer. How can "Home Health Chemistry" help you? "Now there is a simple, inexpensive, no-frills solution that you can use to put your mind at ease." Get the ingredients and follow the instructions – that’s all you’ll need to test for the presence of hazardous chemicals in your home in a matter of minutes. "Home Health Chemistry" gives you do-able solutions and practical information! The best part is that you do not need to be a chemist or have any scientific expertise to perform these tests. We’ve simplified the testing methods so that most of the ingredients consist of water, vinegar, or rubbing alcohol. You won’t have to untangle highly technical language. We make it simple. We give you the information and the means to achieve a safe environment for you and your family. Start exploring now! 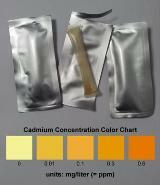 Use this simple and reliable Cadmium test kit to check for Cadmium at home and protect your loved ones from chemical poisoning. 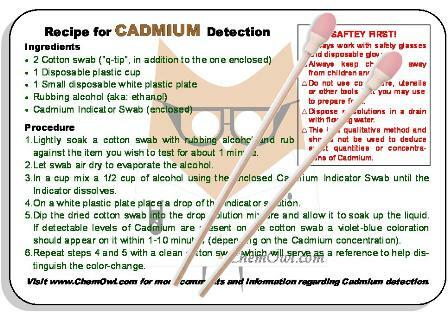 Use these simple and reliable quantivative Cadmium test tubes to check for Mercury in water and solutions at home and protect your loved ones from chemical poisoning. 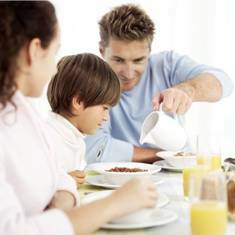 Use this simple and reliable BPA test kit to check for BPA (Bisphenol A) at home and protect your loved ones from cancer and chemical poisoning. Use these simple and reliable quantitative Hexavalent Chromium Test strips to check for Chromium VI at home and protect your loved ones from chemical poisoning. Use this simple and reliable Lead test kit to check for Lead at home and protect your loved ones from chemical poisoning. 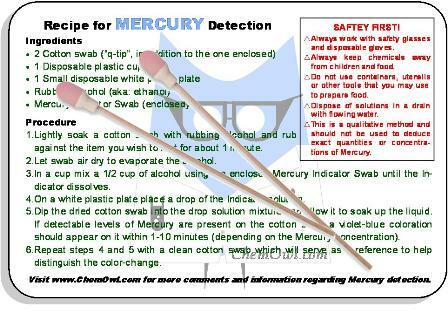 Use this simple and reliable Mercury test kit to check for Mercury at home and protect your loved ones from chemical poisoning. 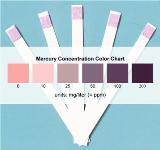 Use these simple and reliable quantitative Mercury test strips to check for Mercury in water and solutions at home and protect your loved ones from chemical poisoning. 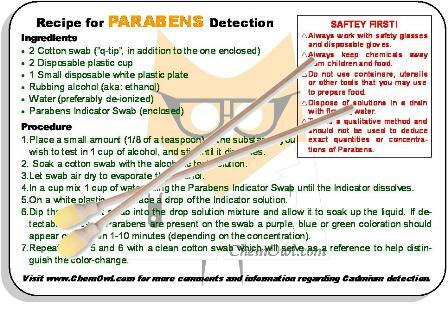 Use this simple and reliable Parabens test kit to check for Parabens at home and protect your loved ones from chemical poisoning. Use these indicators along with detection recipes included in our test kits to test for BPA, Lead, Mercury, Parabens, and more. The Hazards of Cadmium Poisoning at Home in Paint, Toys, Water, Cosmetics, etc. Learn about the dangers of Cadmium in your home, where to find it, how to detect it and protect your family. 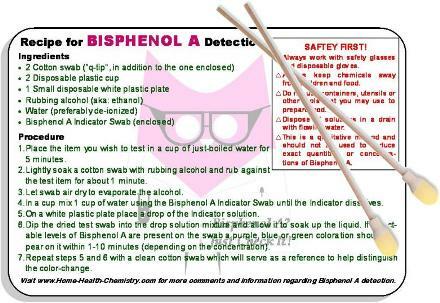 Learn about the dangers of Bisphenol A in your home, where to find it, how to detect it and protect your family. Learn about the dangers of Lead in your home, where to find it, how to detect it and protect your family. The Hazards of Mercury at Home in Fish, Over-The-Counter Drugs, etc. Learn about the dangers of Mercury piosoning in your home, where to find it, how to detect it and protect your family. The Hazards of Parabens at Home in Deodorants, Shampoos, Processed foods, etc. Learn about the dangers of Parabens in your home, where to find them, how to detect them and protect your family. 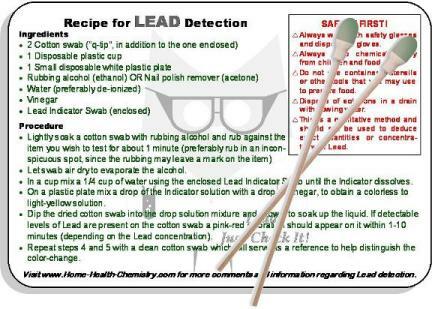 Use these easy to follow detection recipes to test for dangerous chemicals, such as Lead, Mercury, Bisphenol A and more, at home and protect your loved ones from chemical poisoning. Answers to the most common questions (FAQ's) about Home-Health-Chemistry's unique chemical test kits. Find out which products in your home pose a chemical hazard to you and your family in our home product safety section. Find out which products in your home have dangerous chemicals that can harm your children on our "Child Safety in the Home" page. 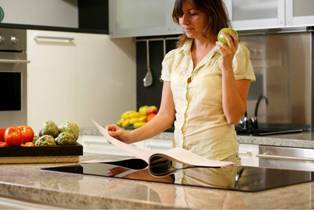 Learn about food safety and the potential hazardous chemicals that are found in food and how to protect yourself. Contact us with your questions and comments regarding hazardous chemicals, home health, or anything else related to our website.